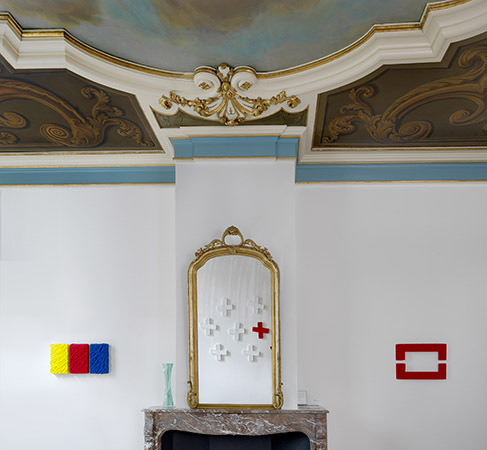 Pino Pinelli, The Merchant House, 2017. Installation view. Photo: Gert Jan van Rooij. The Merchant House presents and sells contemporary art. Established by Marsha Plotnitsky, Artistic Director, in 2012 as a modern take on the Amsterdam tradition of a merchant, it is a self-supporting art space. We seek to explore the city as a critical nexus and reconnect with the avant-garde themes that exemplify it. In the four years of its program, The Merchant House has organized thematic exhibitions for international and Dutch innovators alike, such as Henk Peeters, Jan Schoonhoven, André de Jong, Chuck Close, Carolee Schneemann, Hilarius Hofstede, Craigie Horsfield, and Judit Reigl. For our TMH Masterworks Series, we invite artists previously featured in the program for special projects to query the essence of what constitutes an art object today and to explore its art historical analytics. Pino Pinelli (b. 1938, Catania, Italy) is recognized as an innovator who over a 50-year career in painting has been strategically forging a most singular creative language. This is the first project in the three-year ongoing program of TMH Masterworks. How does a young artist insert him or herself into the history of an art medium? In Making Things Happen, we broach this issue in a series of three collaborative exhibitions of six young French artists who share geography, art education, and attitude to their métier. The shows are organized as visual dialogues—both playful and serious—between individual works. The project is conceived by Marsha Plotnitsky, TMH Founding Artistic Director, in collaboration with art writer and curator Hubert Besacier.